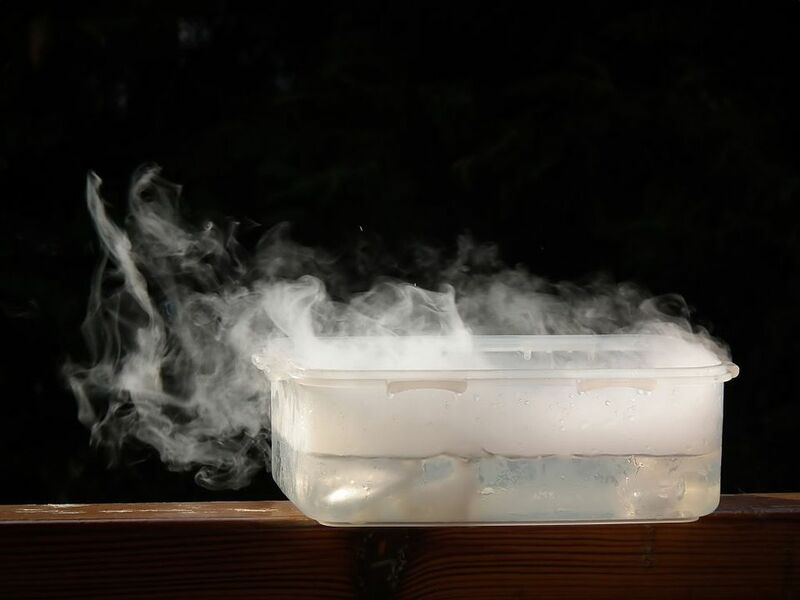 Is dry ice a good solution for keeping items cold or frozen in your ice chest when you are going camping? Using dry ice in your cooler is a great idea, but there are some safety precautions and disadvantages as well. Dry ice also doesn't melt and leave a puddle of water. As it warms up, it turns into a gas rather than liquid. That means that the items in your ice chest won't end up in a puddle of water. Dry ice has a short shelf life. You can't store it in your home freezer and keep it frozen as it needs to be at -109.3°F or -78.5° C or it will simply disappear as a gas. You can expect to lose five to 10 pounds in 24 hours. You should buy your dry ice immediately before you head out camping. If you are transporting your cooler in your car, keep in mind that it will be giving off carbon dioxide gas and there is the potential that levels may rise to unhealthy levels in an enclosed vehicle. You can get a headache and rapid breathing and even pass out. It's best to only use it if you are transporting your cooler separately from your driver and passenger compartment. You will need to wear gloves and long sleeves when handling dry ice. It can burn your skin just like fire, so treat it as if you were handling a red-hot iron rather than an ice tray. Most large grocery stores sell dry ice, including Safeway, Walmart, and Costco. You may want to call to check that they have it in stock before you rely on it. Some stores require that you are 18 years old or older to buy dry ice, so don't just send a teenager to make the purchase. Check stores near your camping destination as well. You may want to restock on dry ice and this will be good to know. To use the dry ice for the best effect, wrap the dry ice in a few layers of newspaper and place it on top of the food. You can place regular ice below. The dry ice will last longer if you don't let it come in contact with any water. Fill any dead space in your cooler with wadded up newspaper, If there is less dead space, the dry ice will sublimate more slowly. Freezing foods before a trip is also a great way to conserve ice in your cooler. Learn more about prolonging ice in your cooler and tips for storing food at the campground.